The pedagogical objectives of project-based learning include dealing with ambiguity and complexity, integration of a variety of approaches, user-testing of the value of proposed solutions, and working with a team of people with diverse backgrounds and skills. In problem-based learning we use domain specific knowledge (for, for example, electromagnetism, data-structures, circuit-theory, accounting etc.) to solve problems in the domain. In both problem and project-based learning the problem drives the learning: students need to assess what they already know, what they need to know to address the problem, and how to bridge the knowledge/skill gap. 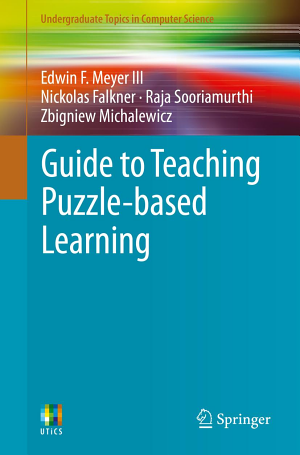 Puzzle-based learning focuses on domain independent transferable skills of critical thinking and abstract reasoning. In addition, puzzle-based learning aims to foster introspection and reflection on the personal problem solving process. What was I thinking? What is the solution? Why did I not see it? Martcia Wade Teaching Award, April 2018. Heinz College, Carnegie Mellon University. Teaching Incentive Program Award, January 2000. College of Science and Technology, University of West Florida. Excellence in under-graduate teaching and advising award, February 1999. Lieber Memorial Teaching Associate Award, March 1995. Outstanding Associate Instructor Award, May 1995. The alumni board of the College of Arts and Sciences, Indiana University. Outstanding Associate Instructor Award, April 1994. Most Enthusiastic Professor, May 2007, MSIS class of 2007, Kelley School of Business, Indiana University. CIS Club Students' Choice Award, April 2006, Kelley School of Business, Indiana University. New Faculty Fellow award, IEEE Frontiers in Education, October 2004. Finalist, Trustees Teaching Award, 2006, Kelley School of Business, Indiana University. Nominated for Innovative Teaching Award, 2004, Kelley School of Business, Indiana University. Nominated for Student Choice Award, 2004, Student Alumni Association, Indiana University. Nominated for the Gordon Faculty Award 2004, Vice Chancellor of Student Affairs and Dean of Students Office, Indiana University. Artificial intelligence and cognitive science with an emphasis on case-based reasoning, knowledge-management, distributed reasoning and machine learning. My other interests include higher order programming languages, software development, computer science / information systems pedagogy. Editor (Learning Lisp), 1997 -- 2002. Association of Lisp Users. I am the pas President of the Alpha Iota Delta international honor society. I've also been active with Toastmasters (CL, ATM-B) having served as my club's President, Secretary, VP for Membership, and VP for PR. Proceedings of the 41st annual meeting of the Decision Sciences Institute, San Diego, November 2010. IEEE Computer, Vol 43, No 4, April 2010. Proceedings of the 20th Australasian Association for Engineering Education (AAEE) , Adelaide, Australia, December, 2009. Proceedings of 25th Annual Eastern Conference of the Consortium of Computing Sciences in Colleges (CCSC-E), October, 2009., Villanova, Pennsylvania, October, 2009. Proceedings of the Frontiers in Education Conference (FIE), San Antonio, Texas, October, 2009. Proceedings of the 14th annual conference on Innovation and Technology in Computer Science Education (ITiCSE), Paris, France July, 2009. Proceedings of the 36th Annual Meeting of the Decision Sciences Institute (DSI-2005), San Francisco, California, November 2005. David Leake and Raja Sooriamurthi. International Journal on Artificial Intelligence Tools: Architectures, Languages and Algorithms (IJAIT). Special issue on recent advances in techniques for intelligent systems. Vol 13, No 1, 2004, pp 237--254. Meng Xu, Mark Fountain, Scott MacArthur, Matt Braunstein, Raja Sooriamurthi. Proceedings of the World Conference on E-Learning in Corporate, Government, Healthcare, and Higher Education (eLearn-2004), Washington DC, November 2004. Proceedings of the Frontiers in Education Conference (FIE), Savannah, Georgia, October, 2004. David Leake & Raja Sooriamurthi. Proceedings of the Sixteenth Florida Artificial Intelligence Research Society (FLAIRS) Conference, St. Augustine, Florida, May, 2003. Proceedings of the Sixth European Conference on Case-Based (ECCBR) , Aberdeen, Scotland, September, 2002. Proceedings of the Fifteenth Florida Artificial Intelligence Research Society (FLAIRS) Conference, Pensacola, Florida, May, 2002. Proceedings of the Fourth International Conference on Case-Based Reasoning (ICCBR) , Vancouver, Canada, July, 2001. Proceedings of the Sixth annual conference on Innovation and Technology in Computer Science Education, Canterbury, UK, June, 2001. Proceedings of the Sixth annual conference on Innovation and Technology in Computer Science Education, Canterbury, UK, June, 2001. Code and Slides from the presentation. Proceedings of the Fifth International Lisp Users and Vendors Conference,Boston, MA, 1995. 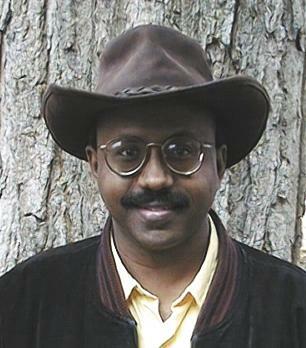 Raja Sooriamurthi and David B. Leake. Proceedings of the eighth Florida Artificial Intelligence Research Symposium, Melbourne Beach, FL, April 1995. pp 218-222. Raja Sooriamurthi and David Leake. Proceedings of the twelfth National Conference on Artificial Intelligence, Seattle, WA, 1994, AAAI Press. Nifty assignments special track, SIGCSE 2008, Portland, OR. Nifty assignments special track, SIGCSE 2007, Covington, KY.
Indiana Multi-Media Users Group (IU-MMUG), February 22, 2007. Slides and the recording of the webcast are available. Taming the Tiger: Taking the Terror out of a Talk. Indiana University, Arts and Sciences Placement Office, March, 2005; April 2006; Dual Career Network, March 2006. "That reminds me of ..." : The Case-Based Reasoning Problem Solving Paradigm. Pensacola chapter of the IEEE society, May 22, 2000. Dynamic Object Oriented Programming: Beyond C++ and Java. Eglin Computer Technology Awareness Seminar, Eglin Airforce Base, March 29, 2000. Why are computers so smart and yet so dumb? Over the years I've had the good fortune to experience multiple cultures, both socially (India and US) as well as academically (engineering, science, and business). Below is a reverse chronology of the places I've been (I'm from Madurai but Chennai was the closest place I could get weather stats on).